Why Can’t the Doc Fix My Kid’s Cold? Happy cold and flu season! How many times have you taken your child to the doctor and been told, “It’s just a virus. Rest, push fluids, and they’ll feel better in about 10 days”? Sadly, it’s true. There are hundreds of different viruses that cause colds, from the most common rhinovirus through the ever-unpleasant adenovirus to the rather pretty coronavirus (it has a crown…). When your children get sick, treat their symptoms so that they will feel better. We have nothing that cures colds–antibiotics do not kill viruses. Salt water (saline) nose sprays are safe. Tylenol or ibuprofen will help with fever and pain. Over the counter cold meds will suppress some of the symptoms in children over 6 years of age, although they’ve never been proven to work for younger kids. Great advice that is heard daily ” why can’t doc fix my kid’s cold” Parents should consider now that the flu season is started for many of us. Calling the doctor sometime is often overlook by many parents. We don’t want the cold to turn into other complications …so I think its better to make that phone call. Would that I could prevent those complications! If only I knew which kid was going to get the ear infection or pneumonia… Best to do what you can to prevent the initial infection: get enough rest, eat a healthy diet, and get that flu shot! Thank you for sharing such good advice and giving reassurance that colds usually just run their course. Also not feeling like the doctor should give antibiotics when they clearly will not help a cold. Congratulations. 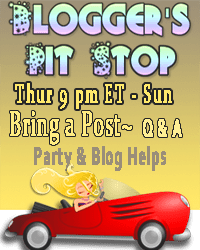 This post was among the most clicked on The Blogger’s Pit Stop #47. Be looking for a feature on Friday. Woo hoo! Thanks so much!